CNN.com | Badudets Everything Nice! 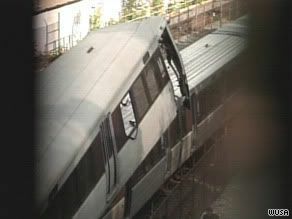 It was a sad news this morning especially for people in Washington, DC because of two train collisions on the Metro’s Red Line during the rush hour. According to CNN.com, 6 people were killed and 76 people were injured. These numbers are still expected to increase as rescue operations are still ongoing. Both trains were on the same track when the crash happened, the other train was stationary. I hope that this is not another terrorist attack for the United States. FBI and other officials are still investigating about the accident. In the meantime, let’s pray for the victims and hope that there’ll be less casualties.